Wang is Curator of East Asian Money at the British Museum and also translates Chinese literature into English. Among her works are the middle grade novels Jackal and Wolf by Shen Shixi (Egmont, 2012) and Bronze and Sunflower by Cao Wenxuan (Walker Books, 2015). Wang has discussed these books in a virtual school visit, an essay, and an in-depth chat with Playing by the Book. Bronze and Sunflower is current Book of the Month at A Year of the Reading the World. Helen Wang e-conversed with me for Cynsations about how she came to translate, and about the challenges of rendering two very different middle grade titles. How did you cultivate the skills needed to translate from Chinese? I did a B.A. 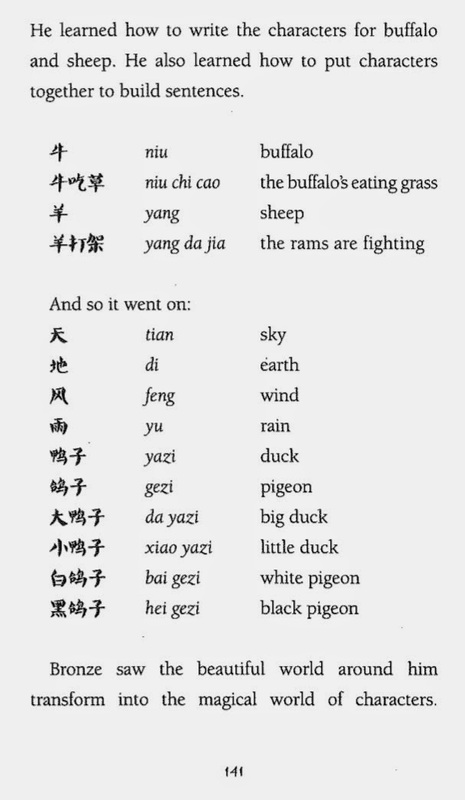 in Chinese at London’s School of Oriental and African Studies in the 1980s. I’d done French, German and Spanish A-levels in secondary school, and was thinking about archaeology or art history, but ended up doing Chinese instead. As for translation skills, those came later. 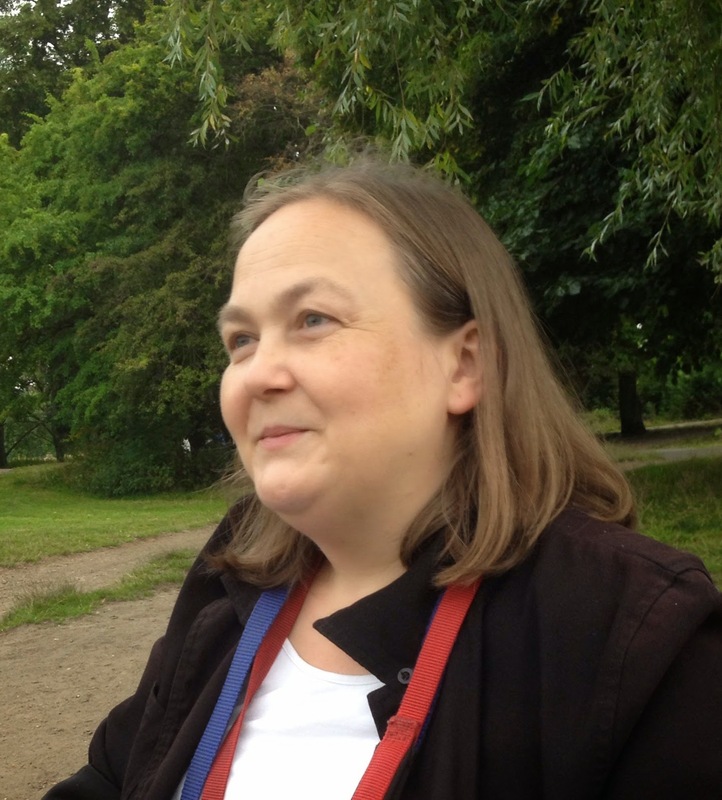 I translated some short stories in the early 1990s, but then started working at the Museum and earning a Ph.D. (in archaeology) and having a family and didn’t really have time for translating fiction until a few years ago. Translation is different from research or everyday communication in another language. Recently, I was one of the judges for the U.K.’s Writing Chinese Translation Competition, and there were 88 entries! The best were those in which the translators had got inside the story and understood exactly what the author was trying to do, and then conveyed this in sharp, crisp English in a consistent and appropriate style. It takes time and effort to get to that level and to maintain it. Let’s talk about your middle grade novels. Jackal and Wolf is a 282-page novel focused on a female jackal. Her prey alone includes crab, cobra, swan, deer, muntjac, bharal, chicken, boar, partridge, rabbit, mouse, frog, porcupine, gazelle, and vole—and these are just some of the animals in the book! Did you spend lots of time researching animal names, traits and terms in order to translate it? I did spend some time on the animals, trying to find out precisely what kinds of noises they make and double-checking that I was using the right verbs for the various actions. A good friend who knows a lot about wild animals read through an almost final draft and made some very helpful suggestions. It’s very much Shen Shixi’s style to explain these things as he goes along. I don’t think I added any details. If anything, I reduced them a bit, to prevent repetition and to avoid saying that the females of a species were “always” smaller and weaker than the males, for example. I toned these down because it’s not “always” true, and because the impact is probably more sexist in English than Shen consciously intended in the original Chinese. In Jackal and Wolf, the jackal Flame forms a bond with a sworn enemy: a wolf named Sweetie. What did you think of the ties and interactions in the story? Although this is an animal story, and there are plenty of episodes and descriptions of animal life, there’s also a lot of human behaviour in the story too. Some of the fighting scenes are quite graphic and intense, but it was the psychological behaviour that I found more disturbing, especially where Flame tests a potential suitor. How did Jackal and Wolf come to be published? Will more of Shen Shixi’s works be translated? 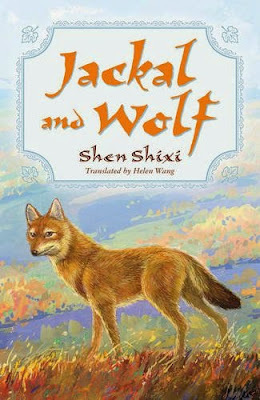 Egmont had a project to publish Jackal and Wolf —and another book, An Unusual Princess by Wu Meizhen, translated by Petula Parris Huang—in eight different languages and to launch them at the London Book Fair in 2012, when China was guest of honour. 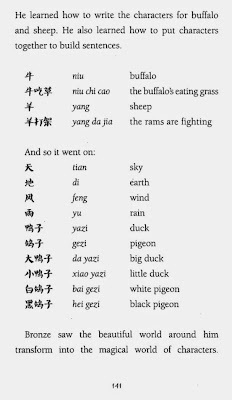 So Petula and I translated from Chinese into English, and our English versions were then translated into Russian, German, Polish, Turkish, Czech, Swedish and Bulgarian. I don’t know of any plans to publish more of Shen Shixi’s animal stories in English, but he’s written a whole range of bestselling animal books. It would be wonderful to see them translated. Bronze and Sunflower by Cao Wenxuan is set in rural China as well, but features humans: a boy and girl coming of age in the late 1960s and early 1970s, during the Cultural Revolution. How did the translation come about? Bronze and Sunflower is a modern classic in China, and the French edition was very well received. Walker Books won a PEN Translation Award to publish it. The PEN awards support the publishers: when publishers apply to English PEN for an award, they have to submit a copy of the original book, which is then read by an expert in the source language, who writes a report to the English PEN committee, who choose which titles to support. So, a huge amount of work went into the English PEN endorsement on the front of Bronze and Sunflower! Someone recommended me to Walker Books, probably because they knew I had translated Jackal and Wolf. 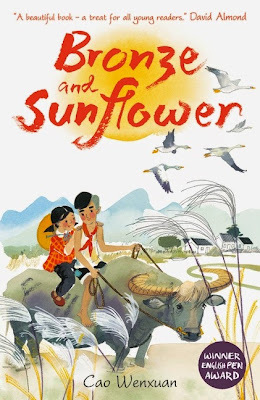 Bronze and Sunflower unfolds in a small village called Damaidi, and begins when a city girl, Sunflower, needs a country boy, Bronze, to save her from danger. Bronze is mute yet possesses vast knowledge and strength. Was it hard to render him faithfully without seeming to overdo it? When I first read the book, I was more concerned about Sunflower being too good than about Bronze’s credibility. Sunflower is a sweet-natured child and almost too kind, helpful and thoughtful to be true, especially when we consider the trauma she’s experienced in her short life: her mother died of illness, she was uprooted with her father to move from the city to the countryside, her father is presumed drowned but his body is never found, she has to wait under a tree being gawped at by the entire village until Bronze’s family eventually takes her in, and so on. Bronze may be the only son of the poorest family in the village, but his family is incredibly strong and resourceful. Instead of going to school, he has spent his formative years with his grandmother, a very determined old lady, and as soon as he was old enough, he was out grazing the family’s water buffalo. He’s used his eyes and his ears and knows his environment better than most of the villagers. This novel, too, must have required research—on everything from the feel of reed shoes, to the look of cogongrass, to the appeal of arrowhead corms. How did you explore new objects and concepts? It’s brilliant to be able to go online and look things up. Google Images is a godsend! For things that are completely new to me, I’ll play around online and do quite a lot of cross checking to make sure I’ve understood. If I can’t work it out for myself this way, or if I don’t feel I’ve understood it properly, then I’ll ask for human help. For example, when a photographer comes to Sunflower’s school in Damaidi, and she knows the family can’t afford to buy her portrait, she tries to hide her disappointment behind a little song. This song is essentially about a married woman with an elaborate hairstyle, and an unmarried girl with a childish hairstyle, who are role-swapping and having fun. But there are so many complex cultural references packed into the four lines! I found lots of amazing pictures of Chinese hairstyles with elaborate names (e.g. these), but it would have been impossible to explain them in four short rhyming lines in English. I must have tried a hundred variations. None of them worked. To keep the song short, I needed to cut some of the detail. But I needed to know how far I could go. If the song was as well known as a nursery rhyme in English, then I needed to know which parts I absolutely had to keep. So I asked around, and I learned that it was more of an obscure old song than a popular nursery rhyme. I grew confident enough to improvise a song that would work in a similar way for the English reader—without drawing undue attention to the complex historical terms for hairstyles. What was it like to translate suffering in the story: a locust plague, near-starvation? My main concern was to convey in English what Cao Wenxuan was saying in Chinese. Those particular scenes brought home how cut-off the villagers were and how self-reliant they had to be. They were also a poignant reminder that this is what famine is like for people across the world when crops have failed. You carve out time for translating children’s books from a busy life. 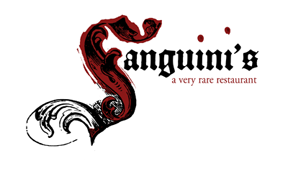 What do novels in translation bring to young readers of English? Good novels are good novels whichever language they were originally written in! But the world is a much more diverse and contemporary place than most English-language bookshops and libraries suggest. Young people all know this, and it’s wonderful to see campaigns like #WeNeedDiverseBooks gathering pace. I translate children’s books in the hope that it makes a difference, and also because I enjoy it! Helen Wang maintains a profile page at Paper Republic and co-tweets with translator Nicky Harman as ChinaFictionBookClub: @cfbcuk. 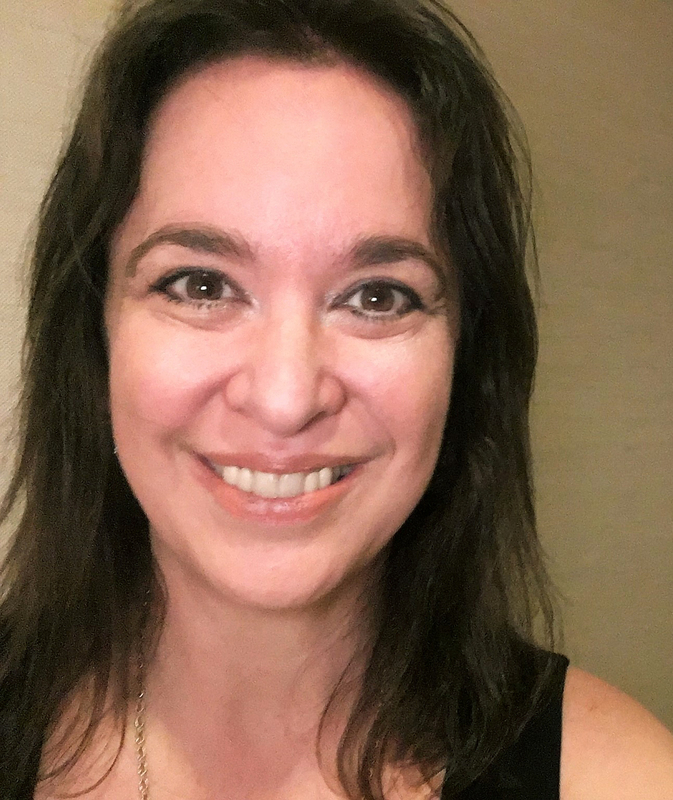 Avery Fischer Udagawa contributes to the SCBWI Japan Translation Group blog and is SCBWI International Translator Coordinator. She translated the historical middle novel J-Boys: Kazuo’s World, Tokyo, 1965 by Shogo Oketani. Very interesting. Thank you for the in depth interview. I also liked the link to the hair designs! This just in: Cao Wenxuan has won the 2016 Hans Christian Andersen Award for Writing, aka the "Little Nobel." He is the first Chinese author to do so. Now is a great time to read his novel Bronze and Sunflower, translated by Helen Wang.